Brighton's set-piece woes continued in a 2-0 defeat at West Brom this afternoon. Here's six things we learned from the game. Much has been said and written about the Seagulls' set-piece woes but Brighton conceded two more goals from corners. In the build-up to the game, all the talk from West Brom fans and pundits was how the match was must-win for the Baggies. They went into it without a win in 20 Premier League games and had scored just four times in eight matches under Alan Pardew. For Brighton to concede from another corner inside four minutes gave the hosts a much-needed lift and left Brighton with a mountain to climb - especially as Albion hadn't scored away since a 1-0 victory at Swansea in early November. West Brom's second ten minutes into the second half pretty much put the game to bed. This has been said before but the Seagulls have to quickly stop conceding so many soft goals from set-pieces. Brighton don't score many goals so giving away so many poor goals will make the task of staying in the Premier League all the harder. Speaking post-match, Brighton manager Chris Hughton said: "We have probably done more work on defending set plays in the last couple of weeks than the season, so that is a concern." West Brom fans knew the importance of today's match and the atmosphere was rocking inside the ground. The Music blaring out of the speakers pumped the Baggies supporters up before kick-off and every home fan also had clappers to boost the level of noise. It's arguably been the best and nosiest home support the Seagulls have come up across this season and the early goal only raised the decibel levels. Baggies manager Alan Pardew spoke about how home games will be crucial for his side in his programme notes, saying: "Our home games will be crucial in determining how our season ends. Today represents the first of many opportunities we have at The Hawthorns to win the points we need. "Our home programme looks reasonable on paper and that should give us some heart as we head into these next 16 games. But all of us have to take the responsibility to make things happen." The same can be said for the Seagulls. They have to start winning more matches at the Amex in the coming months to keep their place in the top flight. 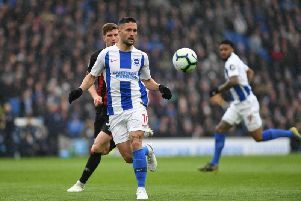 Brighton failed to score for the ninth time in 12 Premier League away matches which just re-emphasised how vital additions are going to be the transfer window. They were almost too predictable attacking at times and desperately need to score more goals in their battle to stay in the top flight. Anthony Knockaert had the best opportunity, with the Seagulls 2-0 down, but blazed over. Brighton have been linked with a number of strikers so far this window - Moussa Dembele, Ze Luis and Florin Andone among them. You can't help but think Brighton need to add at least another striker and winger to boost their attacking options for the final third of the season. West Brom ended their club record winless run with a relatively comfortable win against Brighton, who were again disappointing on the road. The Baggies had failed to win in 20 league matches and had recorded just two victories in their last 31 Premier League games but eased to all three points this afternoon. The Seagulls have now won just once in 12 league games and have failed to score in more than ten hours on the road. Brighton started the day 12th but have now fallen to 15th, just three points above Stoke who have a game in hand. Things don't get any easier for the Seagulls next week when Chelsea head to the Amex. An incident between Brighton defender Gaetan Bong and West Brom striker Jay Rodriguez has been reported to The FA. The pair clashed shortly after the Baggies went 2-0 ahead, with Rodriguez holding his nose and then wafting it but Bong reported something Rodriguez said to referee Martin Atkinson. Atkinson then spoke to the fourth official Tony Harrington, who wrote down some notes about the incident. Both managers confirmed post-match that Bong had reported Rodriguez for something he said and it the matter will now go to The FA. There has been much debate over the use of VAR in the past week, with the Seagulls' FA Cup clash with Crystal Palace the first time it had been used in a domestic match in England. Glenn Murray's late winner against the Eagles was given after referee Andre Mariner had checked with VAR (video assistant referee) Neil Swarbrick that the goal was legal. VAR was also used in the League Cup semi-finals last week, so it's unlikely it will be long until it's a regular feature in Premier League matches with a little bit of tweaking. Had it been in place today, would Brighton have conceded a first half penalty? Murray's hands were up as he blocked a Matt Phillips shot. Referee Martin Atkinson signalled Murray was stopping the ball from hitting his face but - like last season against Sheffield Wednesday when Murray conceded a penalty for a similar incident - would another referee have given a different decision? Had VAR been in place and the decision looked at, it would have been interesting to see what would have happened.